According to this research report, the global hydrogen market is anticipated to grow at a robust rate to reach a significant value by the end of the year of assessment. The hydrogen market has been experiencing steady growth during the 2012-2016 timeline. It is projected to grow at a value CAGR of 6.1% throughout the period of assessment, to reach a market value of more than US$ 200 Bn by end of 2025 from a market valuation of about US$ 130 Bn in 2017. Hydrogen is a vital carrier of energy that can support the future requirement for clean energy across the globe. This can support the initiative of reduction of greenhouse emissions and also the reliance on fossil fuels for energy. The factors that are supporting the growth of the hydrogen market include increasing preference for onsite hydrogen generation systems, increasing technological developments, increasing use of hydrogen across various industry verticals and introduction of green production technologies. Production of electrolytic hydrogen is associated with high costs, which has resulted in growing emphasis on enhancing the overall production process and its economics. Various developments that have a positive impact on the efficiency of the process, for instance, advances in membrane and catalyst effectiveness, are expected to lower down the costs associated with the production of electrolytic hydrogen in the coming years. A specific focus on technical scale of production that includes overvoltage reduction of oxygen evolution reaction (OER) in electrolyzers and development of high pressure electrolyzers is anticipated to emboss a positive impact on the growth of the global hydrogen market. This impact on hydrogen electrolyzer production is expected to increase the competition among various players. Manufacturers are entering into strategic alliances and partnerships or joint ventures with local/regional players to gain edge in the global market. The regional markets in Asia Pacific, North America and Europe are being focused upon by market participants owing to the high growth potential reflected by these regions and their huge market size. In the region category, Asia Pacific is expected to be the largest with a high market attractiveness. This region is characterized by high demand for hydrogen based fuel vehicles in counties such as Japan. In addition, automotive manufacturers are planning to establish auto fuelling stations in the region. These aspects are pushing the growth of the hydrogen market in Asia Pacific. According to the analysis from the research report, Asia Pacific is expected to hold more than one-third of the total market share in the coming years. In 2017, the hydrogen market in Asia Pacific was valued at about US$ 35 Bn and is estimated to touch a valuation of more than US$ 70 Bn by the end of the year of assessment. Moreover, hydrogen market in this region is projected to grow at the highest rate during the period of forecast. The hydrogen market in Europe is the second largest. 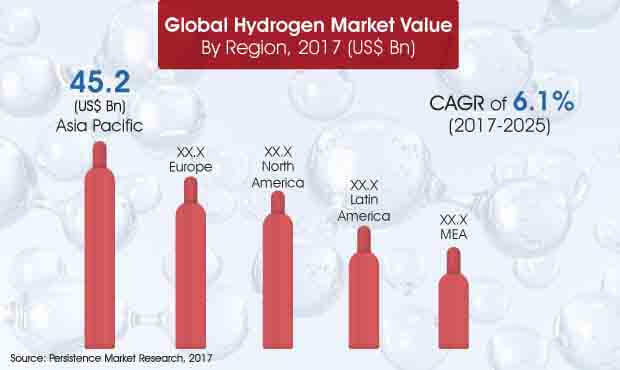 The increasing adoption of hydrogen across various industries in Europe has presented potential opportunities for the growth of the global market. The hydrogen market in Europe is projected to grow at a value CAGR of 6.4% throughout the period of assessment.